Ever wondered about whats happening with the wondrous bee, pollinator of food sources? 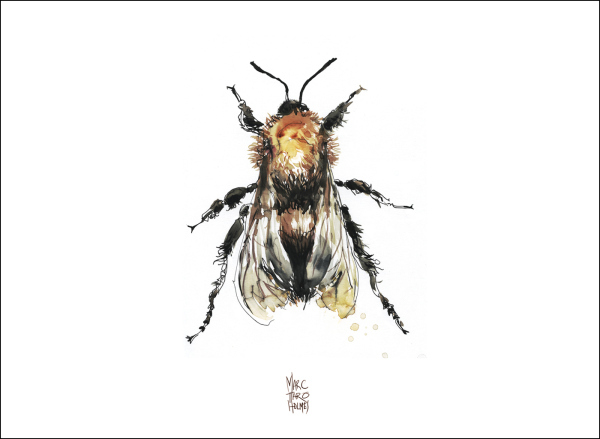 Here is a spectacular story on bees, bee co-operatives, bee sketches and bee love. Marc Taro Holmes works wonders with words and pens. I imagine we have all heard the stories about the vanishing honey bees, collapsing colonies, and the risk it all poses to the production of food. This spring it seems every news outlet was running something about bee-troubles. (Note – not a domestic honey bee in the sketch – I was down at the Jardin Botanique, so I popped into the Insectarium and sketched the exotic bees on display). The strangest I saw was about bee rustling. This is crazy right? The idea that beehives are now so important to food producers, that it’s become worth it to steal some hard working beekeeper’s insects. Unscrupulous individuals show up in the dark of night, steal the bee-boxes, spray a new logo, and the bees are in a different field the next day. It’s a beehive chop shop! Hey! Thanks for the re-blog :) Let me know if you see any interesting opportunities for sketching in your design practice. I’d be happy to help out.